Over the course of the following year, Harriet stood resolute and firm. Slowly her kin came to see that she had thought through the consequences of her actions very carefully and that she had sought divine direction. A turning point seemed to come when her sister Mary Brinsmade wrote to one of her sisters and her husband, the minister. In it she expressed her own initial opposition to “the subject” but that her emotions had since become conflicted. Mary felt the family’s opposition was inflicting a huge toll on their parents in their declining years, and they had only done what they had thought best in not immediately telling the whole family. Mary also expressed the view held by some of her Christian friends that they should be supporting Harriet and that no good could come of the continued family feud. Stephen, who had taken part in the effigy burning, reconciled with his sister and eventually the entire family came around. Over a year after their bans were published, arrangements were finally made for the couple to be wed at the Gold homestead. Elias had been sent hate mail while in Georgia, including drawings of the gallows. When he arrived at Hartford, it was thought best for him to travel the remainder of the way to Hartford in disguise, as the townsfolk remained opposed to the marriage. Elias and Harriet were married on May 1, 1826, and spent their wedding night at the inn at the Logan Homestead, Washington, CT. The inn was protected by Captain Logan and his armed men in case of trouble, but the night passed without incident. The following day the Boudinots left for the Cherokee Nation in Georgia, which took them forty-seven days to reach. The Mission School was closed later that year. In her letters to family, Harriet described a good life, and that she had been warmly welcomed upon her arrival. Elias became the editor of the Cherokee Phoenix, the first tribal newspaper in the country and was paid $300 a year, enabling the couple to live a good life. Harriet had six children, when she fell pregnant with her seventh. Meanwhile, the land of the Cherokees which was rich and fertile, was coveted by white settlers. 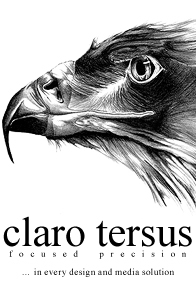 They encroached on the Cherokee lands, and petitioned the government to move the Cherokees - by force if necessary. President Andrew Jackson, the seventh president of the United States, was in favor of relocating the Cherokees and tensions began to rise. 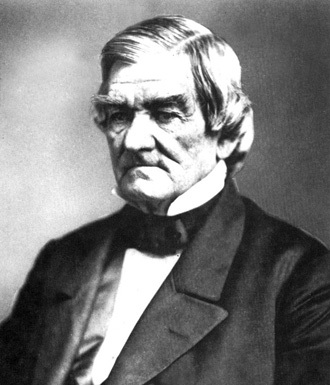 Elias was vehemently opposed to the idea, as was the Principal Chief of the Cherokee Nation, John Ross. 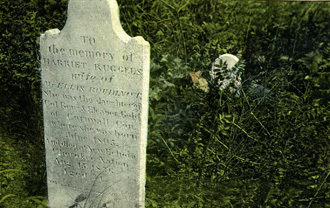 Then tragedy struck when Harriet and Elias’ child was stillborn in May 1836. According to some accounts it was complications from the birth that led to her death on August 15 the same year. She was thirty-one. Harriet was buried at New Echota, and Elias erected a tombstone made from marble brought from Connecticut. Her grave was the only one that was distinctly marked amongst the many hundreds at New Echota. With other tribes such as the Choctaw (1831), the Seminole (1832), the Creek (1834) and then the Chickasaw (1837) being relocated the future looked grim for the Cherokee Nation. Ross remained staunchly opposed to any relocation, but Elias, his younger brother Stand Waite and Major and John Ridge, came to the belief that a relocation was inevitable. Their view that they should seek the best possible treaty they could obtain, and after several meetings in Washington the Treaty of New Echota was signed. The quartet were seen as traitors by many in the Ross camp, but the relocation proceeded and the last of the Cherokees left on December 4, 1838, under the armed ‘supervision’ of General Scott, for west of the Mississippi River in what is now Oklahoma. The journey has become known as the Trail of Tears , and approximately 4,000 Cherokee died of smallpox, famine and exhaustion. The men were never forgiven and on the evening of June 21, 1839, a party of Cherokee men drove up to Elias’ house and asking for medicine, shot him dead as he stepped outside. Major and John Ridge were also killed that night, but Stand Watie managed to escape. Elias and Harriet’s children were sent back to Connecticut, where the three girls, Eleanor, Mary and Sarah stayed with their Aunt, Mary Brinsmade who had interceded on her sister’s behalf all those years earlier. Sarah, the youngest, died soon after. 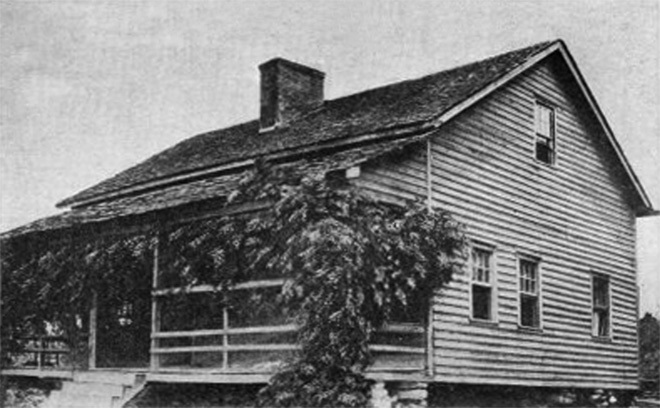 The boys, William Penn, Frank Brinsmade, and Elias Cornelius, were sent to school in Manchester, Vermont, before finishing their education at The Gunn School, in Washington, Connecticut. Stand Waite went on to become a famous confederate general in the Civil War. 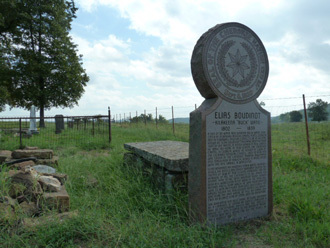 Elias’ grave still stands in Worchester Park Hill Mission Cemetery, Oklahoma. ONE would like to thank Stephen Bartkus, the Curator of the Gunn Historical Museum, Washington, CT and Sarah Griswold, the Curatorial Assistant for their invaluable help in the research of this article.